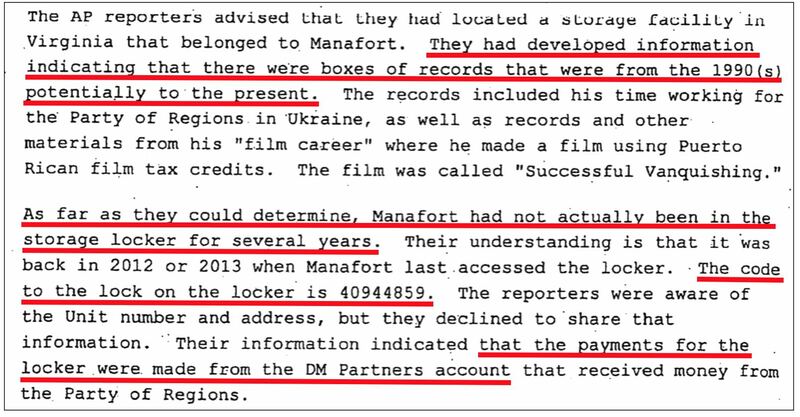 In late June, Politico's Josh Gerstein reported that the Associated Press, in a 2017 meeting with FBI and Justice Department officials a month before the appointment of Special Counsel Robert Mueller, had voluntarily "disclosed the existence of a storage locker used by Paul Manafort." 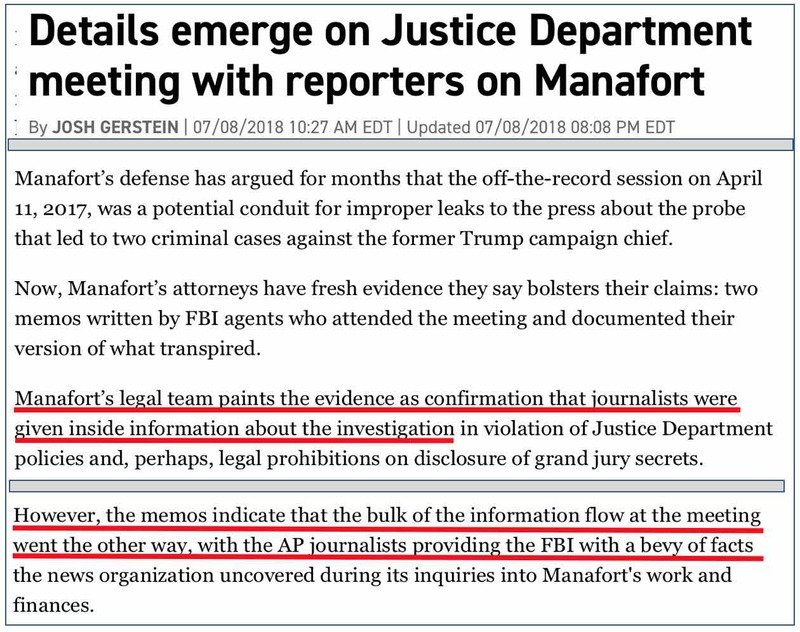 A Sunday report by Gerstein further revealed that AP gave FBI-DOJ "a bevy of facts" about Manafort's business dealings. Two internal FBI memos released in Friday court filings documenting that meeting's discussions indicate that the wire service essentially gave the FBI and DOJ a roadmap for investigating and prosecuting Manafort, effectively acting as unpaid informants. Reacting to Gerstein's earlier report, NewsBusters editor Tim Graham told Jeff Mordock at the Washington Times that the April 2017 meeting made AP "look like anti-Trump activists who brought Paul Manafort to the FBI." The FBI memos in Friday's court filings strongly reinforce that appearance. One of the memos to which Gerstein referred, composed by FBI agent Karen Greenaway, included detailed information the AP provided about "their interviews in Cyprus," "Manafort's relationship with Ukranian oligarch Rinaht Akhmetov," "Manafort's time in Ukraine," and the storage locker. Then the AP reporters — get this — listed 11 "entries or individuals they felt should be followed up on," presumably by the feds. It seems likely that AP learned at least some of the underlined information by posing as something other than reporters to receive assistance from a Manafort associate or storage facility personnel. As to the location of the storage unit, Greenway's memo above only refers to "Virginia." But the other memo, prepared by Jeffrey Pfeiffer, who has testified that AP's storage locker revelation shaped the FBI’s investigation, noted that the storage facility is in "Alexandria, Virginia." If AP was really interested avoiding accusations of actively assisting law enforcement, it wouldn't have told the FBI anything about the storage locker. Instead, by disclosing that it was in Alexandria and providing the facility's nine-digit access code (likely to open its access gate), it revealed that Manafort's records were at one of a very few storage facilities with an Alexandria address. A search Monday at Sparefoot.com returned only three. It seems likely that the FBI should have thanked AP for improving their understanding of Manafort's business dealings. The AP's April 12, 2017 report on Manafort's business dealings gave no indication that the wire service had any direct contact with U.S. law enforcement.